SimScale announces the groundbreaking release of a brand-new GPU-based solver using the Lattice-Boltzmann method (LBM), which pairs high accuracy with unparalleled speed and is accessible via cloud. Partnering with Numeric Systems GmbH to develop this innovative feature through their tool Pacefish®, the cloud-based simulation company has reduced running times for transient simulations from weeks and days to hours and minutes. Developed by Numeric Systems GmbH, Pacefish® is a completely new implementation of the Lattice-Boltzmann method (LBM) tailored to the massively-parallel architecture of GPUs. Its ability to efficiently run on multiple GPUs in parallel enables turnaround times that are 20-30x shorter than with traditional methods. Moreover, Pacefish® supports several turbulence models such as Smagorinsky LES, hybrid uRANS-LES SST-DDES and SST-IDDES and uRANS k-omega SST making it unique and superior among other LBM solvers. In its first release, SimScale’s new solver enables virtual wind tunnel analysis for wind loads on buildings, pedestrian wind safety, automotive aerodynamics, and other external flow applications. Several validation projects have been carried out, comparing the generated simulation results with wind tunnel measurement data and will be shown in this webinar dedicated to the release. As with every solver on SimScale, users can benefit from this innovative technology without specific hardware requirements related to graphics cards, data storage or CPU performance. Relying on cloud computing, users can run industrial-scale external flow analysis with hundreds of millions of cells within just a few hours computing time on up to 16 GPUs. “The accurate analysis of transient flows has historically been fraught with very long computing times and high up-front costs in order to yield realistic results. With the release of this new Lattice-Boltzmann solver, CFD engineers no longer need to choose between speed and accuracy—and on top of that, can access it with the convenience of an entirely web-based workflow. We’re very excited to see our customers seize the new opportunities this technology is opening up,” said David Heiny, CEO and co-founder of SimScale. Companies and engineers interested in learning more about SimScale’s new GPU-based solver using the Lattice-Boltzmann method can register for a free webinar here. 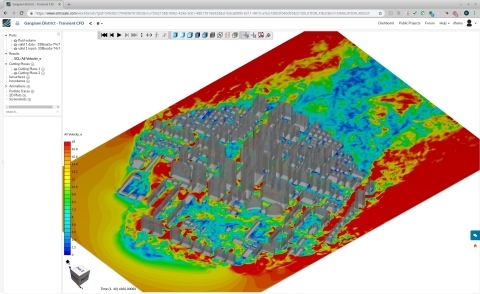 By providing instant access to CFD and FEA in a standard web browser, SimScale is the world’s first production-ready SaaS application for engineering simulation.